An evil witch has kidnapped Victoria's parents and now it's up to her to save them! But first, Victoria needs to learn the fine art of magic. Dive into a magical world of witches and wizards. Travel through magical lands, relaxing music and help Victoria collect unique items along her journey to become a witch. 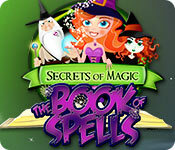 Learn from the ancient Book of Spells in this engaging Match-3 game and prove your skills in challenge mode! Secrets of Magic: The Book of Spells is rated 4.5 out of 5 by 22. Rated 5 out of 5 by denniann2 from a great M3 game this is a long game-100 levels- but i only had to restart 2 levels. of course i played on the custom level. once you earn the power ups you refill them by making matches. there is a good selection and the closer i got to level 100 i had to use more than 1 in the level to get through it. 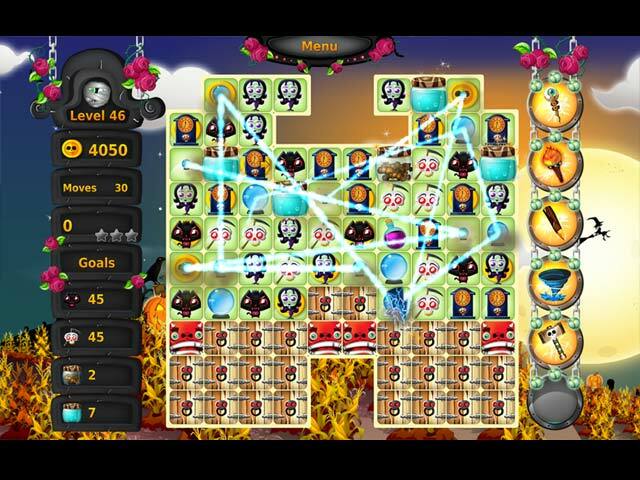 Rated 5 out of 5 by Bumbles2 from Lots of fun learning new spells !!! Young Victoria is a witch and didn't know it because she grew up in an orphanage !!! Then along comes Aunt Wendy and tells her the evil witch Agnes is holding her parents captive and tells her that she is going to teach her some spells so that she can rescue her parents from that horrible evil witch Agnes !!! This match 3 is a delight to play from kids to adults !!! The story captured my interest right away also. The music seemed fitting for the game and the graphics were top-notch !!! There are a few levels that are quite challenging but if you use some strategy and watch the Imps closely you'll beat those few challenging levels !!! I really enjoyed this game...it was different than a lot of Match 3 games and I liked that. I know you'll have fun if you just give the Demo a try !!! Have fun all !!! Rated 5 out of 5 by Casima from Really great! My first thinking was how I love the magic creatures and accessories pic on the tiles. The graphics are nice too. The challenge level is ok. I prefer timed levels instead of moves but the gameplay is great! Rated 5 out of 5 by fredandethel from Really clever Match 3 Didn't think I'd like this at first, as I usually find games which consist mainly of lowering items to the bottom of the board boring, and there didn't seem much variety of board shapes. But the bonuses and obstructions work so well I'm totally hooked. Rated 5 out of 5 by Pz3J from Insanely Good Match 3 Secrets of Magic: Book of Spells is intricately fun and sufficiently Potter-esque to attract any witch or wizard. The graphics are sharp and properly good, along with deeper gameplay than the usual match 3. Yes, the story is pretty cheesy, but the player can easily gloss over it. The gameplay and graphics both justify spending the money to buy it. I can't wait 'til October when I'll be putting hours and hours into this game! Oh, and the Music! The music will cause you to put up your Halloween decorations in June, hehehe! Rated 5 out of 5 by Jaine9 from Interested to play Anyone out there please help me I am nearly at Level 100 haven't win yet keep doing it over & over many times don't know how to win, any tip please? 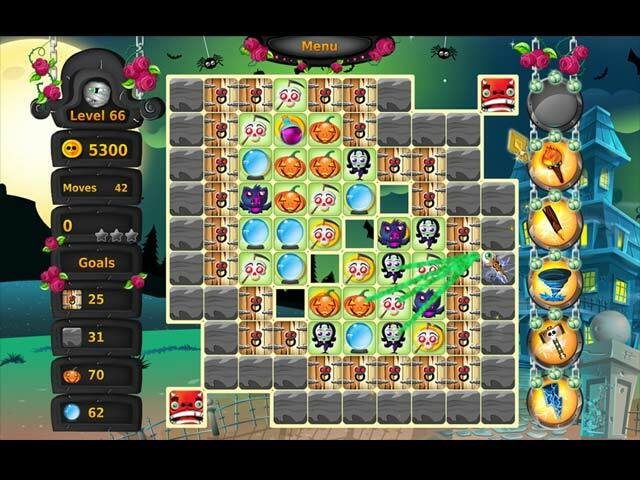 Rated 5 out of 5 by deddu from Wonderful World of Spells Help Victoria learned spells in 100 levels. You can play relaxed or number of moves. This game becomes challenging as the levels progress. There are blocks, concrete, spiders and monsters to defeat. You earn coins to obtain and upgrade 6 power-ups. The power-ups can be upgraded three times. If you play number of moves, the coins you continue to collect will buy you more moves. Rated 5 out of 5 by twinklefish from An Addictive Match 3 I played this game from start to finish, all 100 levels, and I loved it. I played in the Challenge mode, which limits the number of moves you can make on each level. (There is also a relaxed mode.) As you move through the game, you accumulate "money" which allows you to buy extra moves. If you choose, you can also just replay the level without spending any of your hard-earned spooky coin. Replaying a level can be quite effective, because there is usually a sequence of moves that works best, at least at the beginning of a level. But you will definitely need the money and the extra moves in the last 10 to 25 levels. I found it interesting and challenging without being impossible to complete, although I replayed some of those last levels many times. But the fun factor was very high for me. The graphics are bright and attractive, there is just enough story to make it interesting, and the music is delightful. I look forward to the sequel! Rated 5 out of 5 by verimeri from Good Fun This is one of those games you simply enjoy playing. You have a choice between relaxed( with no move limit) or challenge. I played the first few levels on challenge then switched to relaxed. There are plenty of power ups to help you. My hint is simple- collect those coins so you can buy more advanced power ups. How many stars you get on a level doesn't seem to matter so unless you are super competitive and want three stars on every level don't worry about them. Rated 5 out of 5 by pennmom36 from IT'LL PUT A SPELL ON YOU! Victoria has been raised in an orphanage, and she barely remembers her parents. She has recurring dreams that an evil witch captured her parents but witches aren't real and it's only a dream, or so she thought! Turns out that Victoria's parents are witches and they really were captured by the evil witch, Agnes. Aunt Wendy has been keeping tabs on her from a distance for her own safety, but now the time has come for Victoria to learn how to cast spell of her own. Aunt Wendy will teach Victoria everything a young witch should know at The Mystic Academy of Magic. So it's time to collect ingredients and cast spells to prove you're ready to face the evil witch, Agnes, and reunite with your long lost parents! I love this whimsical Match 3 game, that actually has an interesting story to go along with it. You can choose Relaxed Mode with unlimited moves, or Challenge Mode which requires each level to be completed within a specific number of moves. The goal is to collect the necessary amount of ingredients such as bear claws, dragon teeth, swamp water, phoenix feathers, scorpion stingers, spider legs, bat blood, grave dust and even vampire hearts (don't worry they don't need 'em) the ingredients are collected by making matches under them until they fall off the board. Making large matches will earn bonuses on the board that will destroy tokens when clicked upon in specific directions. The points you earn will determine whether you earn 1-2 or 3 golden stars, and you can replay the level to try for a better star score. Some of the tokens have coins hidden under them that can be used to upgrade your Bonus Power-ups which are earned as you progress. The Wand allows you to choose one token to destroy, the Torch will destroy spider web obstacles, and eventually you will receive Stakes, Whirlwind, Hammer, and Lightning Power-ups as well. There are the usual obstacles, wooden crates that can be busted to expose ingredients by matching tokens next to them, Spider webs that require matches made of the same token as the token covered by webs. As you progress a Wicked Spider will torment you by throwing spider webs at random tokens to slow your progress, the spider can be eliminated by making two upgrades to the Torch Power-up bonus. 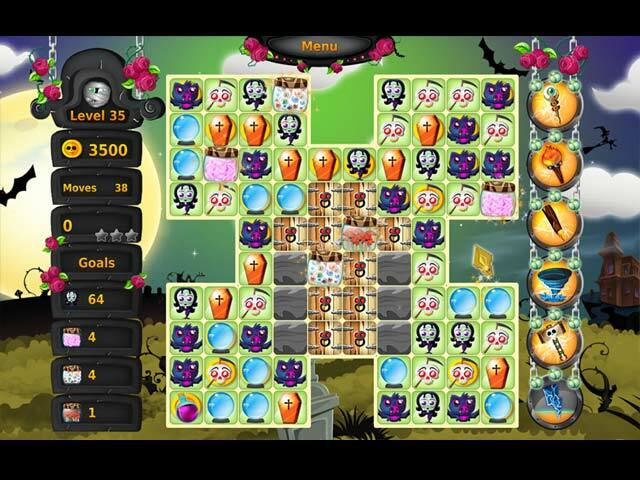 This Match 3 game would be perfect for Halloween, but it's still delightful to play anytime, enjoy!